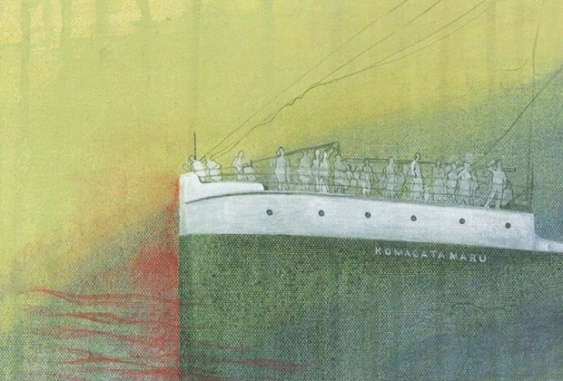 This powerful group exhibition is one of several events this year to mark the 100th anniversary of Canada’s refusal to allow entry by 376 Indian migrants aboard a Japanese steamship, the Komagata Maru. Much has been written about the incident, part of Canada’s troubled history of thwarting immigration from Asia, but curator Jordan Strom believes this is the largest exhibition to engage the topic. The show includes 10 artists who use painting, drawing, sculpture, photography, video and installation to reflect not only on the specific incident, but also on more recent histories of oceanic migration. It features work by Vancouver artists, including notable figures such as Ken Lum and Paul Wong, along with artists who live elsewhere in Canada, as well as India and the United States. Full article in Galleries West magazine, Fall/Winter, 2014. This entry was posted on May 31, 2014 at 5:08 am and is filed under Art. You can follow any responses to this entry through the RSS 2.0 feed. You can leave a response, or trackback from your own site.